This is one of the projects I have been working on as I try to "wrap up" all of my Christmas gifts (hee hee!). This was pretty quick and easy, as far as gift-making goes. I think the most time-consuming part of this project was picking out the frame! 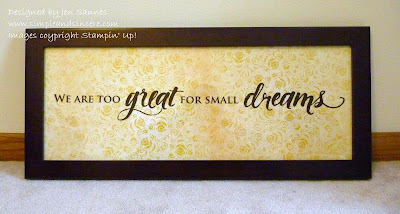 The phrase is from the Decor Elements catalog - Great Dreams (small) in Chocolate Chip. I chose a frame that is two panes of glass, where you can suspend photos between the glass and still see the wall behind the photos. I decided on this type of frame because that way the recipient can choose to showcase photos or designer paper (like I have done here) or she can leave the frame empty and simply display the phrase. I used a two sheets of Razzleberry Lemonade designer paper in the frame, trimming the pages to the desired size and taping the seams together on the back of the paper. You really can't see the seams, which I'm very happy about! :) I think that my mom will love this gift - it will be perfect for her quilting room. Want to see more products from the Decor Elements line? Visit my demo web site for more information.